Settle a debate about a hot-button issue or optimize workflow with a one question poll, sent to your whole Team. Ask them who the next company speaker should be (Serena Williams, obviously) and book with confidence. Gather feedback on a survey you’ve created before you send it out to your customer base, student population, or event attendees. Once a survey or poll starts getting responses, pin it up, so everyone can see the results. Help the team track their work. Keep the team up to date with instant and daily notifications, when your survey receives a new responses. Set up notifications for new feedback comments, so survey owners can automatically incorporate improvements into their work. Install this integration by hitting “Go to Microsoft Teams” at the top of this page (you’ll need to be logged in to both your SurveyMonkey and Microsoft Teams accounts). 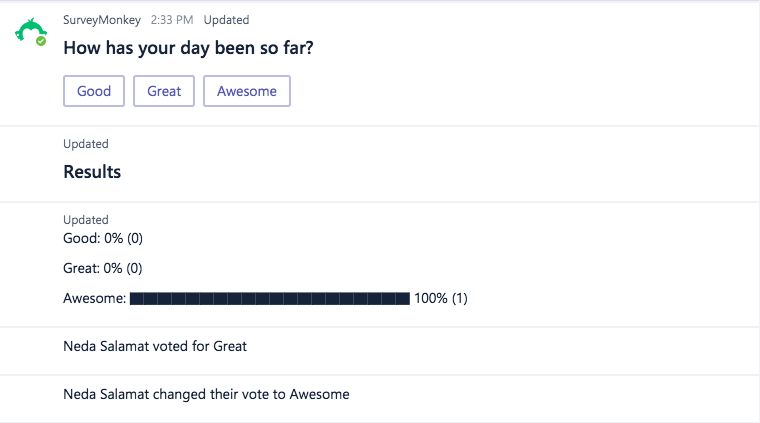 To send a poll to your team, connect SurveyMonkey to Microsoft Teams. Then, using the Discover bots option in the search bar, connect to the SurveyMonkey bot and add it to your Team’s conversation with @SurveyMonkey. To add a SurveyMonkey tab, click the + symbol next to “Conversations”, and decide what survey information (creation, results) you want to share with the team. To set up survey notifications, click on the channel you want to notify (in the sidebar), and choose “Connectors” under the ellipses. Then, search for SurveyMonkey. Still have questions? Visit our folks over at the Help Center.